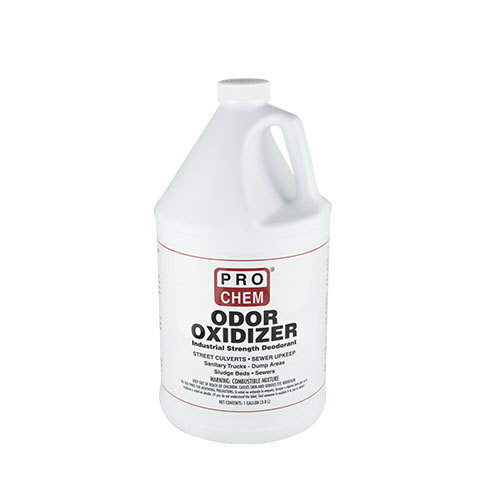 Odor Oxidizer | Pro Chem, Inc. ODOR OXIDIZER rapidly penetrates the source to control bad odors with a three-way action. It 1) deactivates the source; 2) neutralizes the malodor; and 3) provides a fresh, pleasant cherry fragrance. Loaded with quality ingredients, ODOR OXIDIZER is very effective as an odor control agent for a broad spectrum of malodors, instantly soluble in hot or cold, hard or soft water. Because it is nonoily and nonstaining, it can be applied directly on any surface not adversely affected by water. As a sewer deodorant, attach to faucet and allow to drip in main line or pour in a small amount. Use full strength to help in areas containing sulfide gases and other strong odors. Spray area daily with a 1% to 2% water solution as a deodorant spray for sanitary trucks, etc.